Original M69 mix written and produced at Love Park Studios, Berlin, Germany. Licensed from Metroplex Records, Detroit. Published by Deep Space Music, BMI. PSYKOFUK mix @ Matrix, Detroit. CD mixed, mastered & engineered for Echospace, Detroit, USA. Original mix mastered and restored from original reel-to-reel master tapes in 2004 @ NSC, Detroit. This CD has been mixed together seamlessly for an uninterrupted listening excursion through the many shapes and forms of this song's incarnations. One of my favourite techno releases. I suppose it's an EP by the letter of the law, although it plays out more like an album. The original Starlight is an understated Metroplex classic from 1995 but the echospace crew demonstrated that Detroit techno, so often accused of reverential retro purism, can still sound like the future. As you'd expect from a label known for rejuvenating dub techno, the various interpretations, mostly involving Steve Hitchell or Rod Modell, may technically form a remix suite but the process calls to mind the time-honoured dub techno tactic of "reshaping" the original piece into infinity through dub techniques. There's more music at work here than simply subjecting the original parts to endless banks of delay and analogue hiss though, and most of the tracks skirt between dub techno's textural opulence and the abstract melodic futurity of classic Detroit fare. Just about every interpretation is solid and the tracklisting is sequenced to form a nicely undulating journey. As an ambient DJ my personal favourite is the Echospace Dub, which I can rarely resist dropping into my live sets. This is most definitely techno for the deep heads. 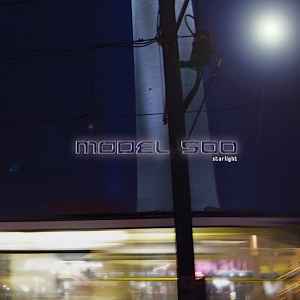 Model 500's STARLIGHT gets released with a whole bevy of remixes, courtesy of the Echospace/Deeochord boys. The original still stands on its own, of course, a deep, hypnotic tune. The "Deepchord Mix" dubs the track out, making it even more spacious. Elsewhere, the "Echospace Unreleased Mix" goes more upbeat, while the "Echospace Dub" goes into dreamy ambiance. Convextion adds a more digital rub to the track, but Mike Huckaby takes it right back to the dancefloor. Stephen Hitchell brings in three aliases, as well, with his Soultek project bringing in some light breaks, his Phase90 moniker trucking in the ambient dub as the beats throb in halfway through, and his Intrusion persona ending this collection with pure ambiance. Starlight has never sounded so stellar.